If you have small children or toddlers, stop throwing out your empty containers! 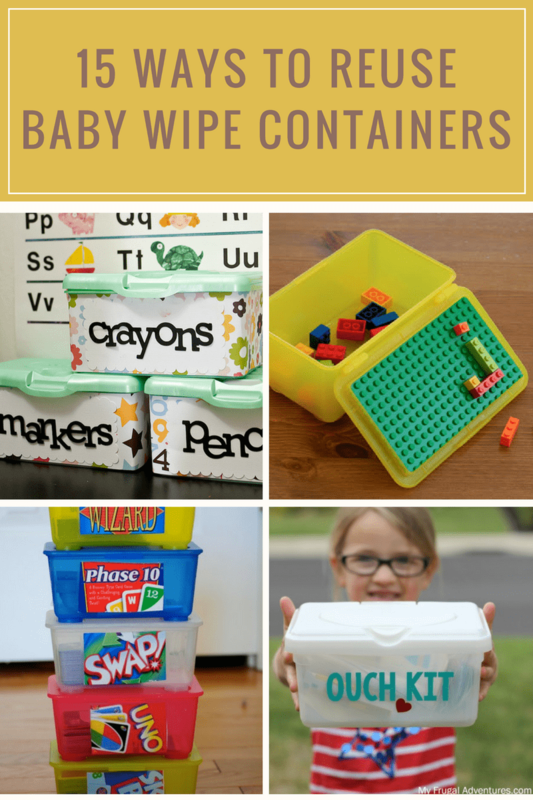 Gather them up, and take a look at these 15 ways you can repurpose baby wipe containers. If you have kids, then you know firsthand just how many baby wipes you’ll go through in a short amount of time. Because the wipes need to stay wet, the container needs to be a durable, waterproof material like plastic. Bad for landfills, but great for many other uses! Baby wipes containers have a lot going for them. Their made of a durable material so they can easily be repurposed for something new. The snap closed to contain items. Their rectangular shape makes them easy to stack and store. So, the next time you pull the last wet wipe out of one of these boxes, don’t throw the box away. Instead, try one of these clever ideas to repurpose baby wipe containers. Art Supply Holder – Check out how Sweet Shoppe Designs used a Cricut to turn her baby wipe containers into storage boxes for crayons, markers and pencils. Lego Travel Box – Get instructions at KV Barn to turn your empty baby wipe container into a Lego travel box. Such a smart idea to keep kids entertained in the car! Playing Card Storage – This idea from Jazzie and Tahlia is such a smart way to store all of those card games that come in flimsy cardboard boxes that fall apart so easily. Car First Aid Kit – Head over to My Frugal Adventure to see what she keeps in her “Ouch Kit” which she keeps in a repurosed baby wipe container. Medicine Container – Over on Hometalk, Kitchen Kelli shares her simple container makeover to make a pretty place to store medicine. DIY Kid’s Treasure Chest – It’s hard to believe these beautiful treasure boxes are repurposed baby wipe containers! Container Garden – Novice Life turned a baby wipe container into a place to start seedlings. Genius! DIY Glass and Mirror Cleaning Wipes – Empty baby wipe containers are the perfect place to keep homemade cleaning wipes. Jessica Kielman shares her recipe for glass cleaning wipes on eHow. Yarn Organizer – Check out how Cynthia from Yet Another Mom Blog turned her empty container into a handy place to store her yarn and ribbon. Sensory Play Organization – See how the Princess and the Tot use an empty wipes container for a fun and simple sensory game. DIY Car Trash Can – Simone at Busy as a Honey Bee dressed up an empty baby wipes container to use as a car trash bin. The end result though is pretty enough to store trinkets anywhere. Plastic Bag Holder – My favorite way to repurpose baby wipe containers is to use them to hold plastic bags. There are lots of different ways to fold them so they pull out easily, but the one in the video below is my favorite because it’s quick and easy. To save money and reduce waste, many people buy the soft baby wipe packages. If that’s you, don’t worry, there are still some repurposing ideas for you! Counting Game – I love how Mrs. Karen’s Class repurposes baby wipe container lids to make learning fun. Peek a Boo House – This idea is similar to the counting game listed earlier but with a fun twist your child will love. DIY Fairy Door – Check out all of the clever fairy door variations Anna and her son created using the lids from baby wipe containers. So cute! What about the small, travel-sized baby wipe containers? Try this DIY Play Laptop idea from She Wears Flowers. You know that you made my day with these great repurposing ideas. Can’t wait to get more things organized around here.